Posted on May 28, 2014 by Lena K.
It’s been a while since I last released a translated doujin, but thanks to my great friend Mai88, I can now proudly present to you one of the best looking adult works I’ve seen in a while. As far as I know, right now, there are no translated works by this artist available, but judging by the quality of the art and also the story itself, I think we definitely need to change that. So here you have it, but keep in mind that this is an adult work. I’ve found one more work by this artist that Mai and I are currently working on. It will feature the same characters, and I think it can be seen as a continuation of this story, so please look forward to the next release as well. This entry was posted in Adult, Doujin, Download, Yuri and tagged Hiiragi Yutaka by Lena K.. Bookmark the permalink. This is an easy way to get me to read doujinshi. I have around 10 that I have bookmarked, but still haven't read. Ah damn it, I looked through it at least 10 times and even had 3 other people read it (like chimeko for example :P). Well, changing the typo is probably useless, since the doujin has already been uploaded on the Dynasty Reader, which is where 99% of the people are going to read it anyway. You're working on a blog? Thanks for the adorable doujin, I loved it. The art is great and I am definitely looking forward to the next one. If you decide to fix the you're/your errors (or any others), we're happy to update the version on the reader. If that's the case, then would you kindly start shipping HimekoxChikane? So that was your handiwork. Well done Euro-Ninja. It was a sweet read. I realy liked the art, especialy the water paint it gave it a sense of beauty. The story was nice, and small. Even if i dont like novellas since it usually lacks the subplots, the multiple points of view, and the generic adaptability that are common in longer mangas (usualy). As being a bigger fan of larger books especially epic fantasy that range too over 1000 pages a book which I can read in under a week, i view short mangas or as I like to call them by a literary form “novella”. Tend to not even wet my appetite let alone quench it. Where there after i'm left with a hunger for more bigger yuri novels, which there is none cause ive read them all a 100 times over (only ones i liked or thought worth reading ofc). So i tend to not read many one-shots in fear that ill be left hungry for more but every now and then i read a one shot that satisfies my hunger and this was one of them. TY, Lena and Mai88 for translating this novella for those of us who dont know japanese, though still wish to enjoy a good yuri one-shot. Ah well, I do enjoy them nonetheless, but I often find myself wishing for more. In this case, we're lucky, since there is a second part, even though I'm not quite sure whether this is a continuation or just another story. When are you going to do Yellow Drops the next comic with this couple by this couple by this author? I'd love to do that one, but we don't have the scans. 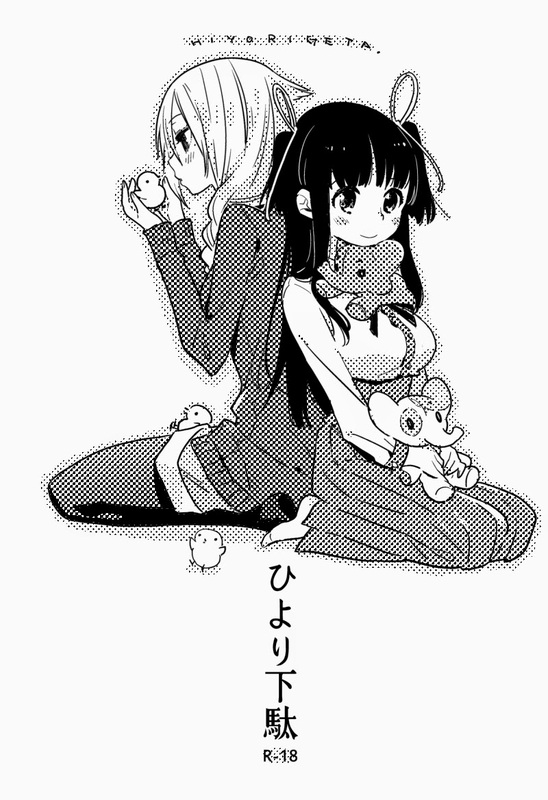 This doujinshi is simply soooooooo sweet!! The frame pressed in my brain for a long time. Hiiragi-sensei well-done!